What is a woman to do when she wakes up one morning to discover she had been in a coma for 15 years? 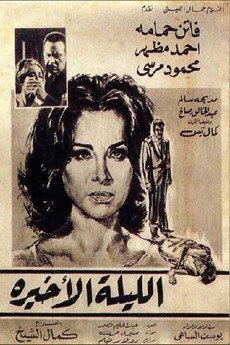 Kamal El Sheikh's 1964 mystery drama, Last Night (El Leila El Akhira), narrativises the tale of Nadia (Faten Hamama), who awakes one day to realise she was injured in a bomb blast that not only induced her 15-year coma, but also killed her sister. Not only that, but Nadia further discovers she is married to her brother-in-law, Shoukry (Mahmoud Moursi), who is out to kill her for the inheritance money. A local doctor, Dr. Ahmed (Ahmed Mazhar), intervenes, trying to prevent Nadia from any more harm. Grappling with the utter complexities of memory, family, health, war, and womanhood, this Cannes Film Festival nominated piece illuminates the stakes and merits of regaining one's agency in the midst of trauma.